Invoice is a necessary document to confirm the shipment of goods from the warehouse and receiving goods to the warehouse. It is issued by responsible persons - a storekeeper or warehouse Manager. 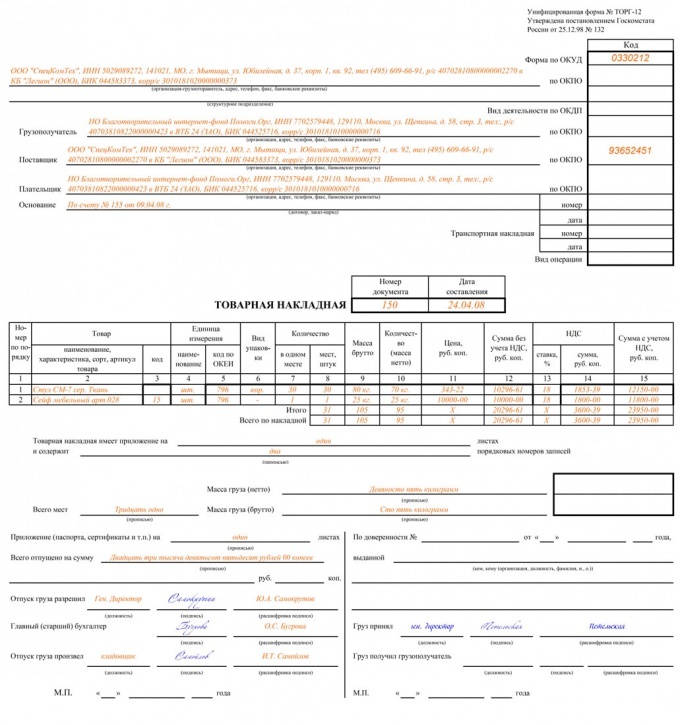 Standardized invoice form is regulated by the Decree of Goskomstat of Russia from December 25, 1998 No. 132, and is called TORG-12. Than waybill differs from the invoice? Prepare 2 blank to fill in as a waybill must be filled in two copies: the first shall remain with the supplier and is the primary accounting document for the write-off of inventory, the second is given to the buyer and is the basis for the capitalization of goods and materials. In the line "Dispatcher" specify the name of the company-shipper, in accordance with registration documents, and email address. In the line "Provider," enter the name of the supplier. It may coincide with the shipper, and may be another legal entity. In the line "Payer" indicate the organization name of the buyer. In the line "Base", specify the number and date of the supply agreement or purchase and sale. Further specify the number and date of bill of lading is issued to the carrier, if any, involved. Specify the number and date of invoice. Fill in the table with the list of goods and materials. The data in the table must match exactly with the data in the invoice to the appropriate party supplies. Commodity invoice needs to sign 3 people: the chief accountant; the employee authorizing the release of cargo (usually the warehouse Manager) and employee, which produces the release of the cargo (the storekeeper). Be sure both copies are stamped by the organization of the shipper. The law allows the use of blank consignment notes developed by the organisation independently. This requires the following data: the name of the document and the organization from which it was made; document date; name, cost and quantity; status and signatures of persons responsible for the shipment and receipt; print on both sides. If the goods are shipped through a carrier, it is recommended to use another form invoice - inventory-vehicles (form No. 1-T, approved by the resolution of Goskomstat of the Russian Federation of 28 November 1997 No. 78).